Summer seems to have arrived here in Eastern North Carolina. The heat and humidity has barged in on our wonderfully sunny weather. I was out treasure hunting today and really was not enjoying the mugginess Mother Nature has dropped on us. Yuck. 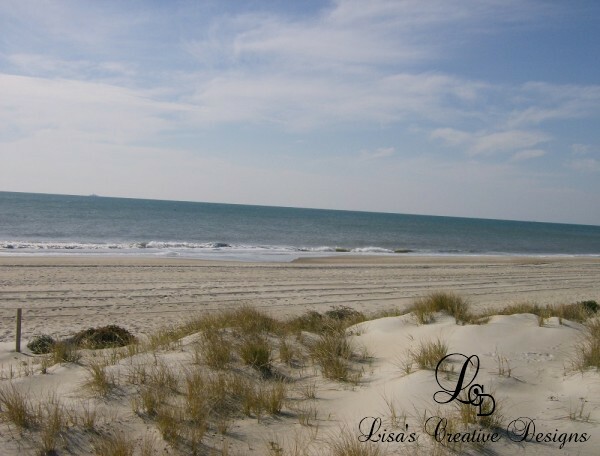 With the heat and humidity however, comes thoughts of the beach. It sat in storage for a couple of years and when I moved into the new shop space, it needed a touch up on the paint. 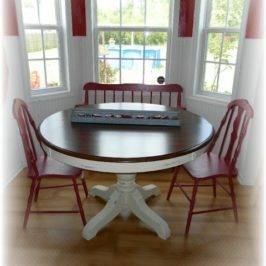 I planned on just giving it a fresh coat of the same light aqua paint and a quickie waxing. As you can see, I took it a bit further than that….. 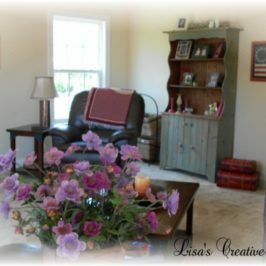 I found a pair of picture frames at a local shop that looked just like bead board. They where plain and white. After some bright lime green paint, some distressing and embellishing, I love how this Bead Board Beach Inspired Frame turned out! 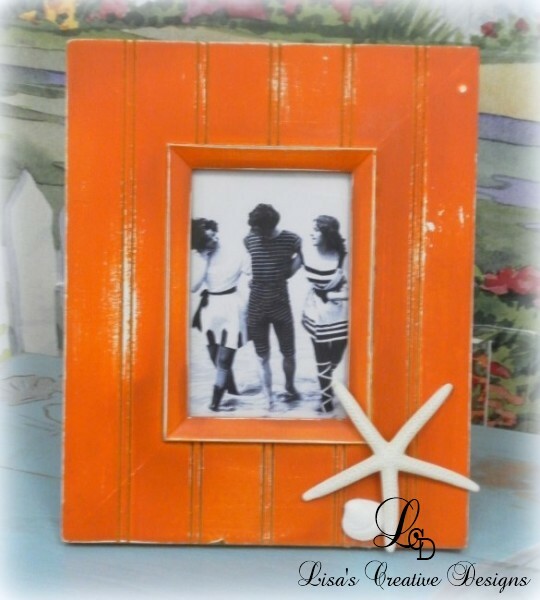 I did the other bead board picture frame in orange . 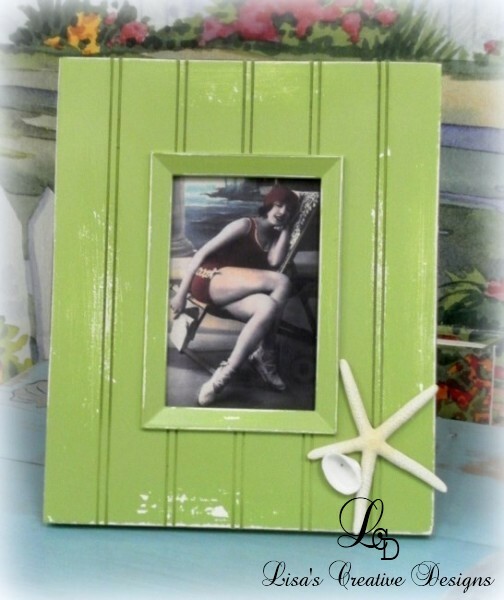 I just love the Vintage Victorian beach images I placed inside each one. 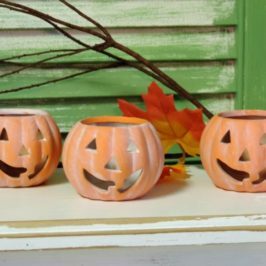 This little orange “sand pail” inspired tea light candle holder is just a cutie pie! Here’s another one I really wish I had a before photo of. 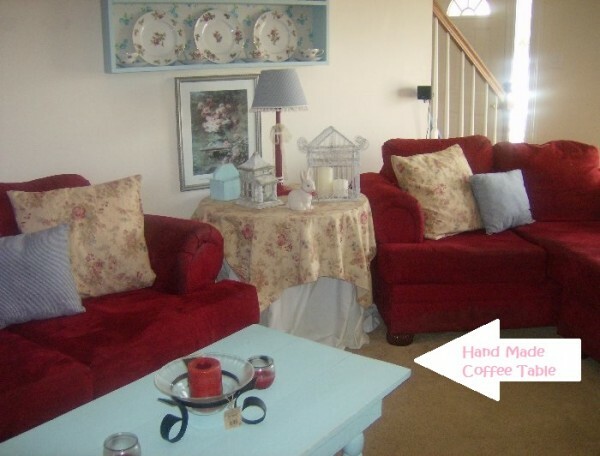 This little accent table was just a plain, simple white and sat in my master bedroom beside my wing chair for years. As you know, I am in the midst of redoing my master and I decided to expel it from the room. I gave it a coat of bubble gum pink paint and some hand painted flip flops on the top. 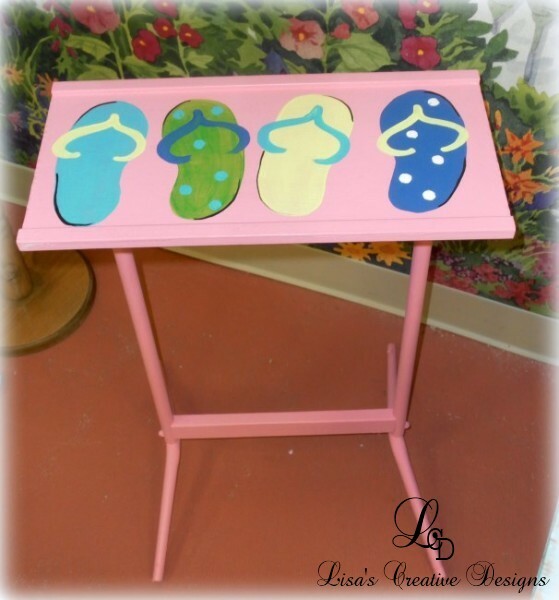 This Hand Painted Flip Flop Accent Table is now so bright and cheerful. Hot pink is such a popular color right now. 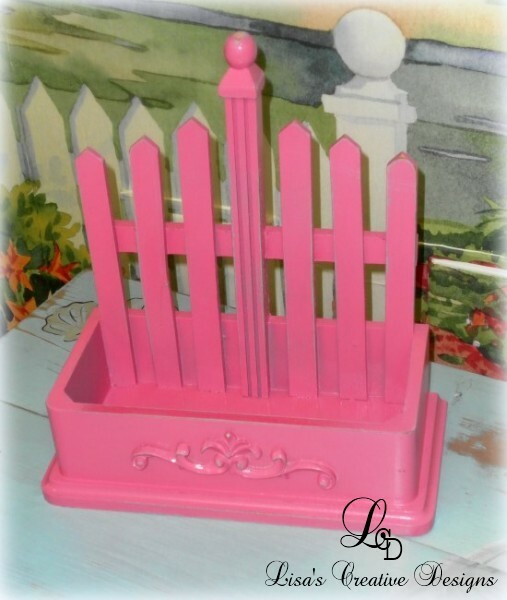 When I saw this Picket Fence Shelf / Planter , I knew it would look great in sizzling bright hot pink. 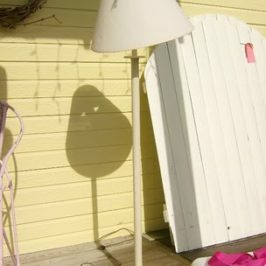 Filled with a couple of candles or small decorative potted plants this would look great in a beach home. Ah, hah! We have a “before” shot! 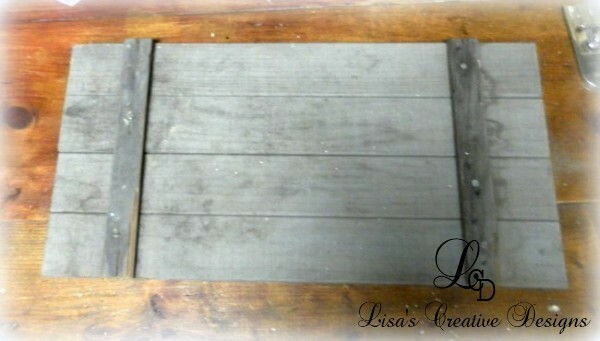 This small cabinet door was found at a thrift shop and it sat in my garage for quite awhile. 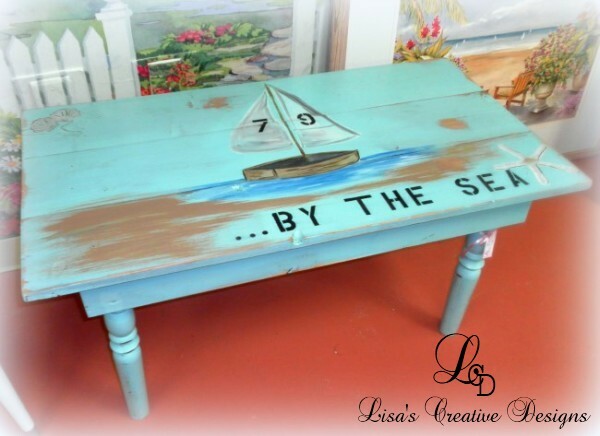 I painted it a cheerful yellow, distressed it and hand painted a vintage style whale image on the front. 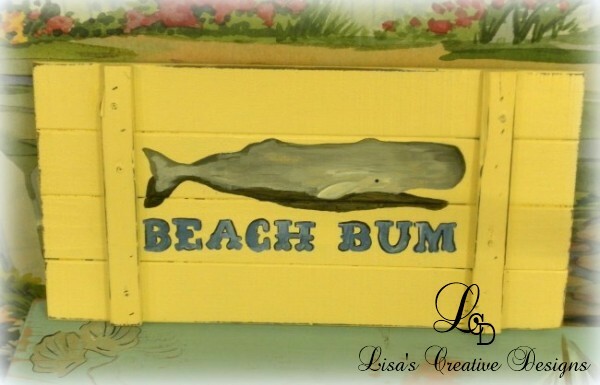 This Upcycled Beach Bum Whale Wall Plaque is now worthy of any beach cottage. 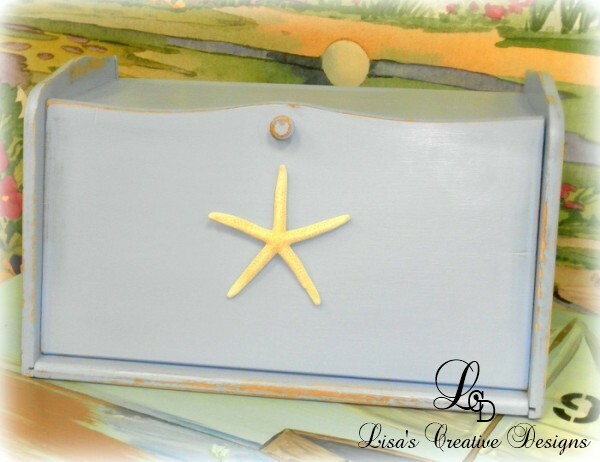 What says “Shabby Chic Beach” in a kitchen better than a Shabby Blue Upcycled Bread Box ? I bought this window shelf at a local retail shop new. It was brown and boring. 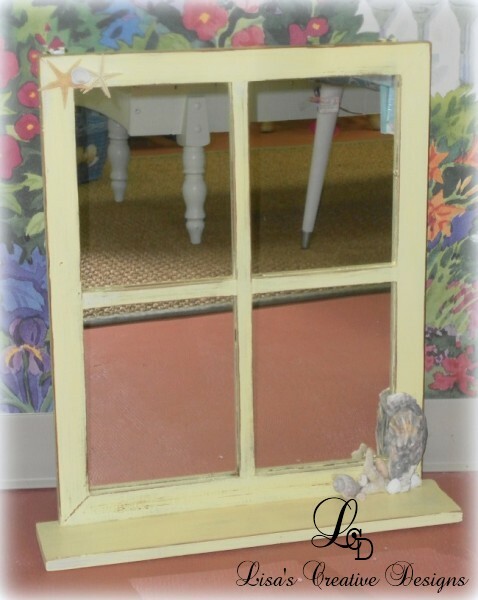 I painted it a soft yellow, distressed it for a shabby look and glued some seashells and starfish to the front. 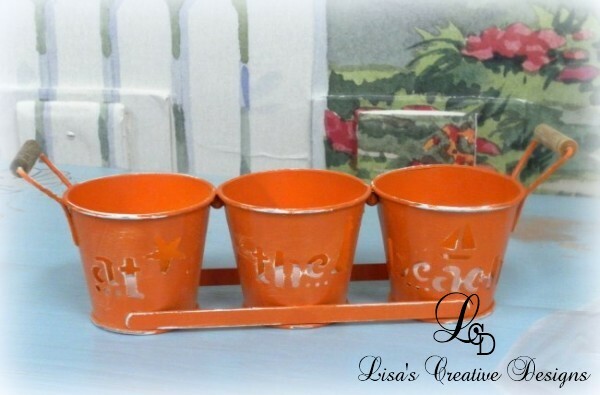 This Beachy Window Shelf now has personality! 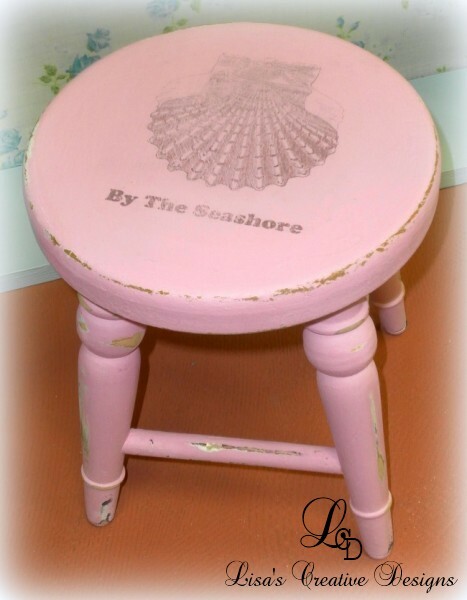 This adorable pink Shabby Chic Beach Stool was a $1 yard sale find. It was multicolored and dated. 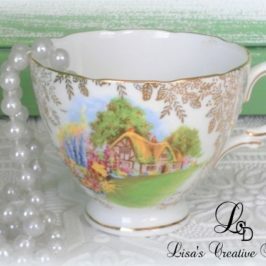 I painted it a pretty pink, distressed it for that well loved “shabby” look and transferred a vintage seashell image from The Graphics Fairy to the top. This was my first attempt at transferring an image using the Mog Podge Method . It was a lot of fun. I can’t wait to try it on a few more pieces! 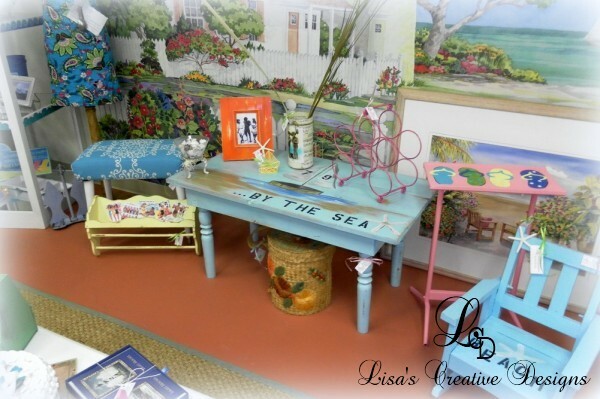 Decorating with upcycled beach decor can make a beach bungalow charming and unique. 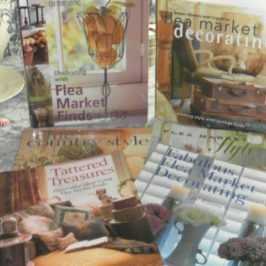 Really cute ideas and beautiful work!